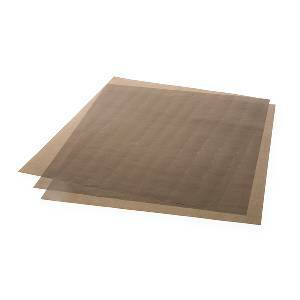 A single sheet of 3 mil teflon to cover your htv items and protect your heat press platen. Can be used to prevent bleed over in sublimation printing. Adds a very light gloss finish compared to silicon sheets or partchment paper. From Anonymous of Cartersville, Georgia on 2/24/2019 . I don't know what took me so long to purchase this, now that I have, I love it. Thank you for the affordable price. I love shopping online with JSI. Their service is fast and delivery is within 2 days ALWAYS! From Marcia Miley of Tallahassee Fl, Florida on 11/2/2018 . These work great. Can't live without my teflon sheet!